BC strawberries are in season, and I couldn’t have been more excited when I found some at the local farmer’s market (thanks Home Sweet Home!) You see, we don’t really have many (or any?) berry farms up here in Prince George, so unless you have a yard where you can plant your own (which I don’t), you have to hope someone brings some up to sell. But I was in luck, and I braved the rain last weekend to buy a big ol’ container full. Of course they are great to snack on just as is. But given that they have a short shelf life (definitely not like the berries we import from California), you have to use them up ASAP, otherwise those delightful red gems will turn to mush. They are super delicate too, so even when you first pick them up, you might find a few squishy ones. But no need to throw those away (or share them with your strawberry lovin’ puppy) – they are the perfect ones to use up in a smoothie! When I went to make my smoothie, I noticed I had some cottage cheese that needed to also be used up in the fridge. 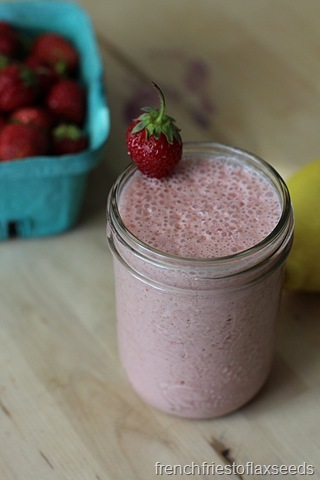 Now, I’ve only rarely used cottage cheese in the smoothie – I find it doesn’t blend well if you don’t have a really good blender. But seeing as I have invested in a Blendtec, I thought I would give it a go. Paired with a little lemon and vanilla, I soon had a frothy, tart beverage that was somewhat reminiscent of cheesecake. And that is never a bad thing. I was a little sad I didn’t actually have any cottage cheese left so I could make it again! 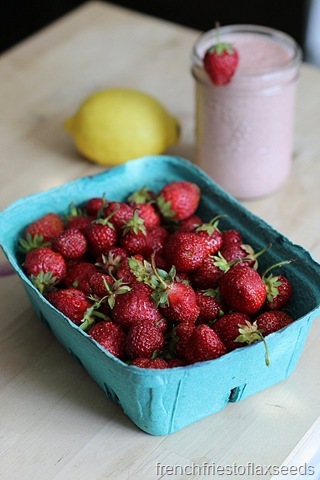 It’s strawberry season, so time to get your fill! 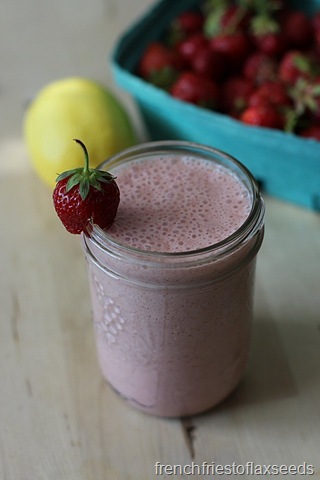 Use up those slightly soft berries to make this dessert like smoothie with cottage cheese, lemon, and vanilla. It might not be the same as eating cake for breakfast, but it’s close enough! 1. 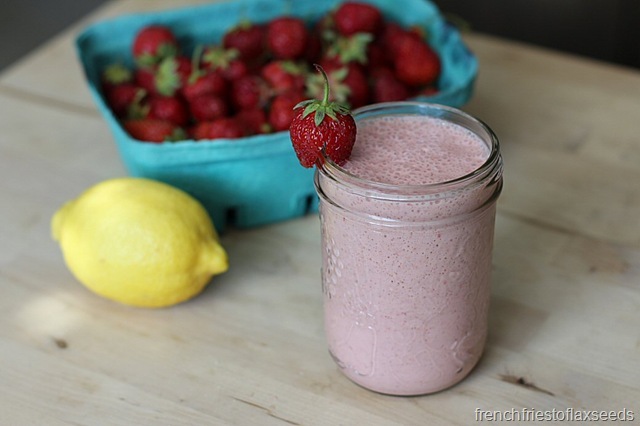 Put all of your ingredients into your blending machine, and whiz away until you have a frothy pink smoothie. Enjoy! Notes: Any seasonal berries would work great here, so try raspberries or blueberries! I like to add the chia seeds to thicken it up a bit when I use fresh fruits. What’s your favourite summer berry?